This is, I think, the complete mise for this recipe. 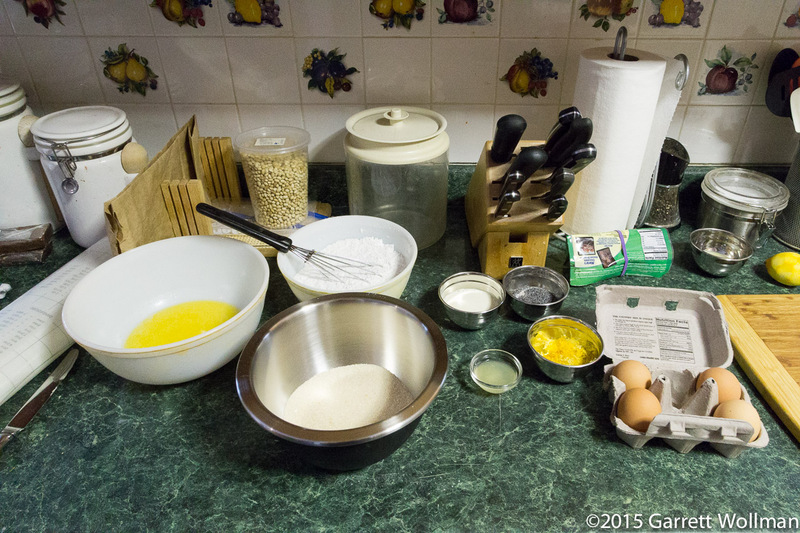 Note the separate bowls of sugar and other dry ingredients. I was a little short on the lemon zest so I made it up with some Meyer lemon (which isn’t technically a lemon) zest instead. Everything else is as described in Chang’s recipe. 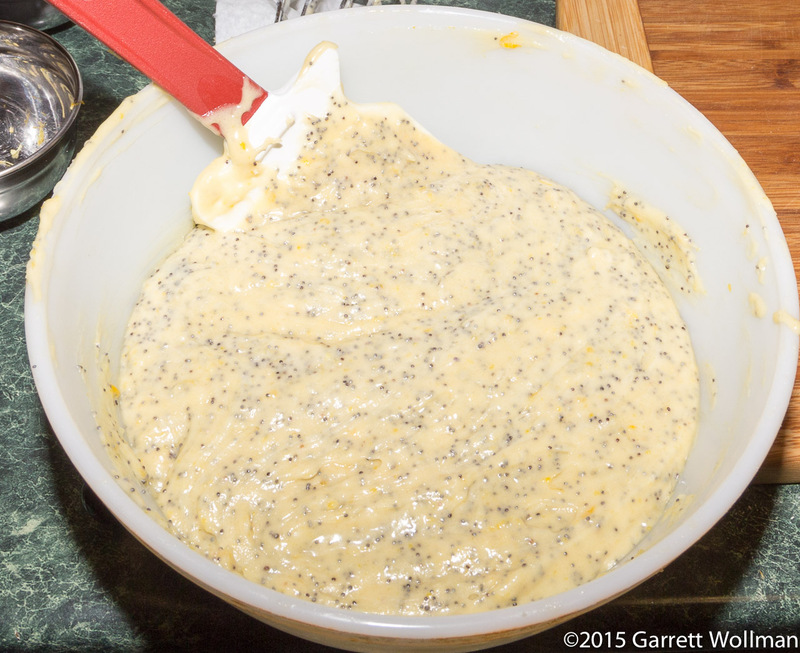 The first step is to mix the melted butter, cream, and flavoring ingredients (lemon zest, lemon juice, and poppy seeds) together. As the recipe suggested might happen, my butter resolidified a bit, and I had to put it in the microwave for a few seconds to make sure the butter would stay melted. 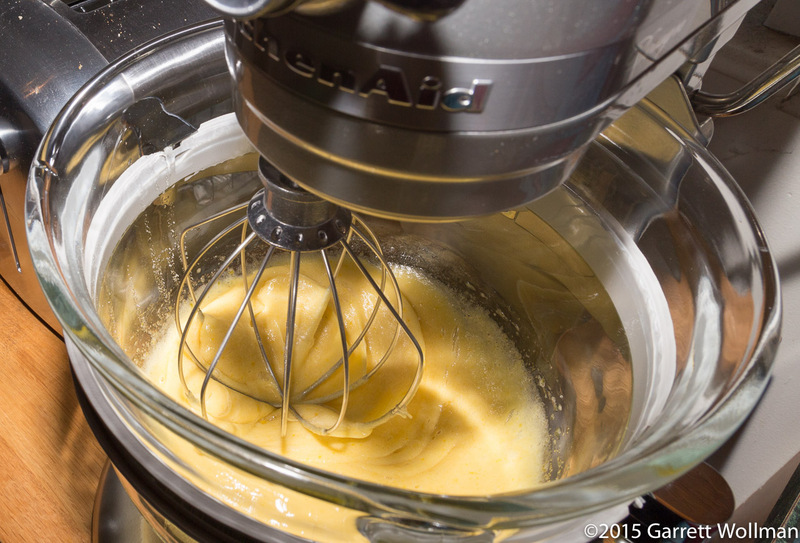 In the second step, whole eggs and sugar are whipped together in the stand mixer until foamy and lightened in color. 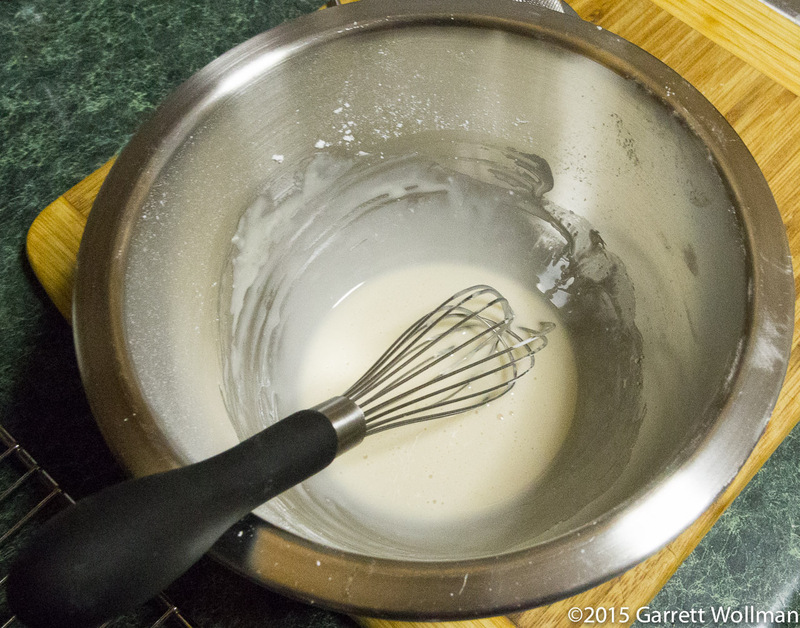 Then the previously sifted dry ingredients (cake flour, baking powder, salt) are folded into the egg foam. 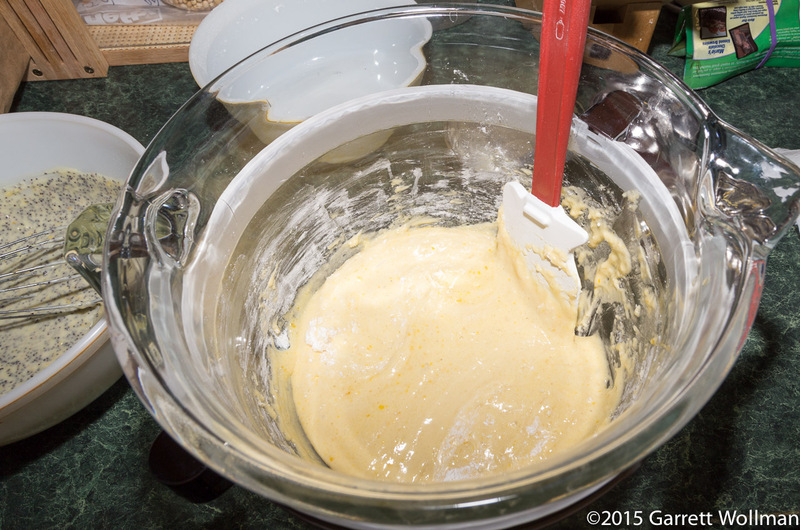 Then the egg mixture is folded into the melted butter. It would have been rather convenient if this had gone the other way — my stand mixer’s bowl has a nice pouring spout — but it can’t be helped, since it’s the egg that has the air in it that we’re carefully folding in so as not to deflate. 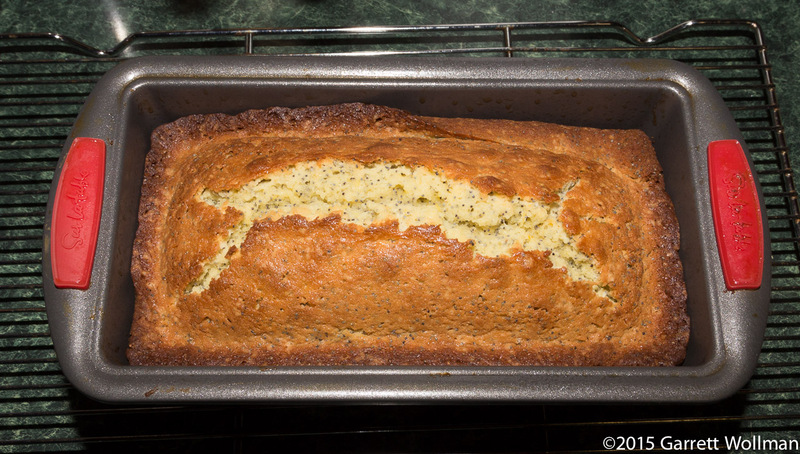 This gets poured into a lubricated 9″×5″ (230 mm × 130 mm) loaf pan and baked for a fairly long time — more than an hour. Unsurprisingly, it has to cool in the pan until starch structure that reinforces the foam cools and sets — half an hour according to the recipe. 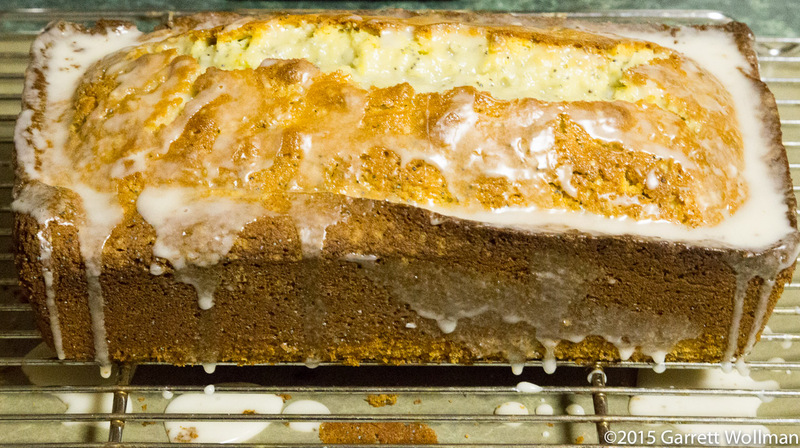 While waiting for the cake to cool, there’s more than enough time to make a simple lemon glaze — what in my dialect we would call “icing” as distinct from “frosting” — from powdered sugar and lemon juice. Now the cake is ready to depan. You can see a little bit of roughness on the bottom edge where there apparently wasn’t quite enough baking spray; I had to run a knife around the perimeter to get the cake to slide out without breaking. I put some waxed paper underneath the cooling rack to catch the dripping glaze, then poured the glaze over the top, using a knife to spread it around where it had pooled up a bit too much. After the glaze dried, I took a slice for myself. I wrapped the rest of the cake in plastic and brought it in to work the next day (where I had another slice, of course!). Opinions were pretty favorable overall, although I still thought it needed a bit more flavor than it had. (Subtle flavors are often lost on me, unless they’re nasty ones like coffee or mushrooms!) It was popular enough (and went fast enough) that I’d probably double this recipe in the future and make two cakes rather than just one. But my next time through, I’ll probably make the vanilla version Chang gives as an alternative — which substitutes vanilla seeds for the lemon and poppy in the main recipe. 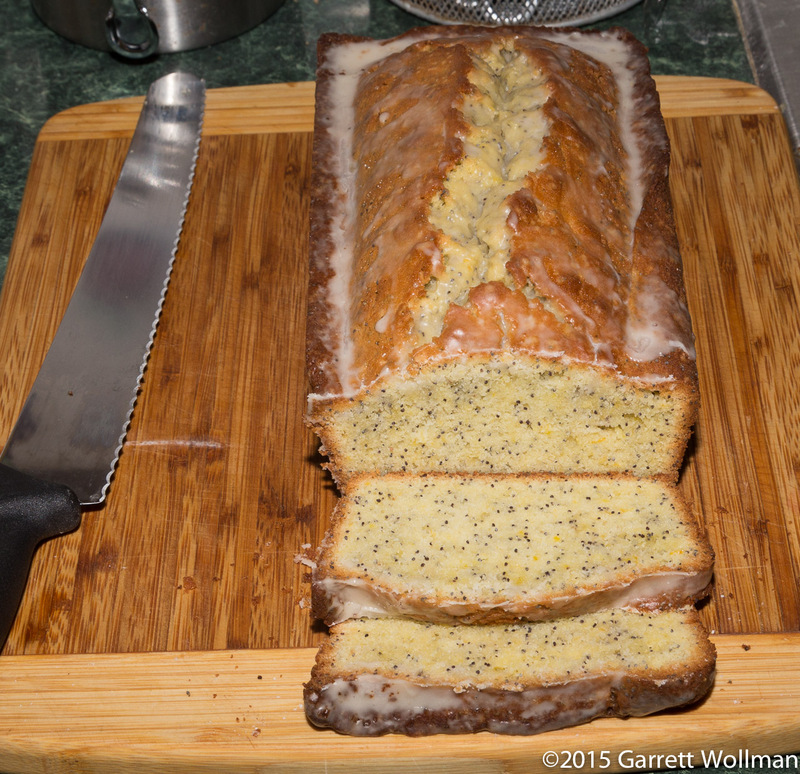 Since it’s baked in a standard 9×5 loaf pan, this cake is 9 inches in length. For service I sliced the cake in half lengthwise, but I had whole slices for myself — figure ¾″ (19 mm) per slice to make 12 slices per loaf. 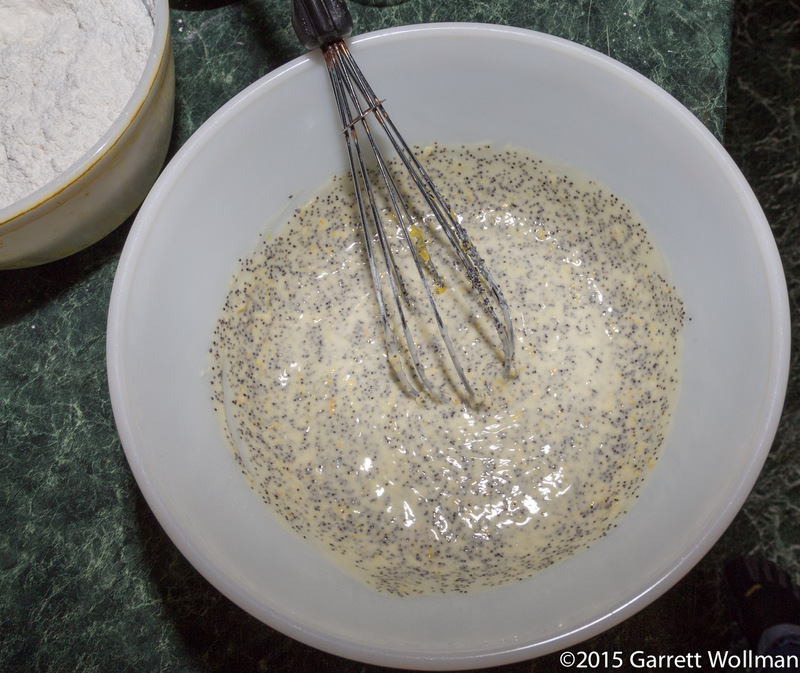 This entry was posted in Food and tagged cake, Joanne Chang, lemon, poppy seed, pound cake, recipe. Bookmark the permalink. Yummy, my favorite…Thanks for sharing this recipe.